Peter Eisenman is one of the most controversial protagonists of the architectural scene, who is known as much for his theoretical essays as he is for his architecture. While much has been written about his built works and his philosophies, most books focus on one or the other aspect. By structuring this volume around the concept of form, Stefano Corbo links together Eisenman’s architecture with his theory. 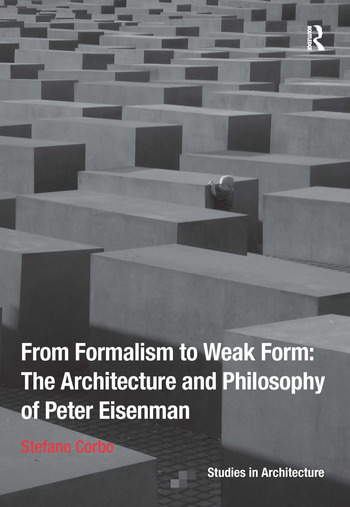 From Formalism to Weak Form: The Architecture and Philosophy of Peter Eisenman argues that form is the sphere of mediation between our body, our inner world and the exterior world and, as such, it enables connections to be made between philosophy and architecture. From the start of his career on, Eisenman has been deeply interested in the problem of form in architecture and has constantly challenged the classical concept of it. For him, form is not simply a cognitive tool that determines a physical structure, which discriminates all that is active from what is passive, what is inside from what is outside. He has always tried to connect his own work with the cultural manifestations of the time: firstly under the influence of Colin Rowe and his formalist studies; secondly, by re-interpreting Chomsky’s linguistic theories; in the 80’s, by collaborating with Derrida and his de-constructivist approach; more recently,by discovering Henri Bergson's idea of Time. These different moments underline different phases, different projects, different programmatic manifestos; and above all, an evolving notion of form. Taking a multi-disciplinary approach based on the intersections between architecture and philosophy, this book investigates all these definitions and, in doing so, provides new insights into and a deeper understanding of the complexity of Eisenman’s work. Stefano Corbo is an Italian architect and researcher at ETSAM Madrid (Escuela Técnica Superior de Arquitectura), where in 2010 he received a MArch II in Advanced Architectural Design; at the same Institute he is currently a PhD Candidate, with a dissertation entitled: 'Archaeology of Infrastructures: A conceptual cartography'. Stefano Corbo has worked as Assistant Professor at the Faculty of Architecture in Alghero, Italy, and lectured at the ETSAM, University of Miami, and University of Wisconsin. In 2012, after collaborating with Mecanoo Architects (Delft, Netherlands), he founded his own office: SCSTUDIO Architecture and Design (www.scstudio.eu ), a multidisciplinary network practicing architecture and design, preoccupied with intellectual, economical and cultural context. He has contributed to several journals (Mark, CIRCO, CLOG, Il Giornale dell’Architettura, Dichotomy, Studio Magazine, Tremors) and his projects have been published worldwide.